Space design oftentimes is led with the aesthetic of the space-how can we make it trendy and cool? But another component that is vital to the efficiency, productivity and well-being of employees is the technology that enables those same employees to perform in their positions. We sat down with Jason Lund, our Director of Audio, Visual and Information Technology to discuss the impact of technology on the workspaces of today and of the future. ACI: Looking at the technology in our space, would you say we’re on trend, and what trends would you like to add? Lund: The ability for space to adapt to the user with a custom experience without you having to actively do or learn something is an important trend and expectation driven by user experiences with consumer technologies. When we designed the Minneapolis WORKLAB technology suite, we tried to leverage intuitive design and behind-the-scenes automation so things “just worked.” People learned to trust if they had to plug a video cable into their laptop, their stuff would pop up on the screen moments later. If they plugged in a USB connection in a video conference room, their computer would recognize the room’s camera/microphone or speakers and set them up in Skype. ACI: What are some of the biggest difficulties you see in today’s workspaces, and how can technology aid in that? Lund: While there are a lot of workspace issues technology can help solve, two of the biggest workplace issues that impact team satisfaction + productivity, particularly in “open” plan offices, are dissatisfaction with temperature and background noise. 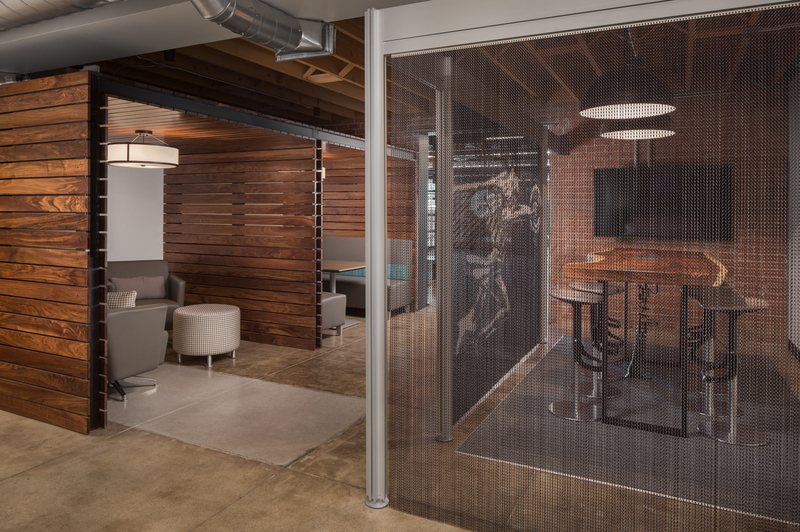 In Minneapolis, we deployed a SoftDB brand sound masking system that measures the background noise level and adjusts itself throughout the day to make sure the soundscape of our space protects privacy while also remaining comfortable for our teams and partners. The system was cost competitive with other solutions but provided significant added value by addressing the frequent changes in background noise level within our space without IT needing to log in and tweak the system constantly. Temperature is something we can’t change at a granular level as we are in a multi-tenant space with centralized HVAC service. However, advances in modern workspace occupancy sensing solutions (like the new Asure OccupEye platform) now include temperature, average sound level and other key space characteristics that we can report on over time and share as part of a wayfinding system to help team members connect to spaces with the amenities and characteristics that best match their work style. ACI: When does technology hit its life expectancy and how far can you extend it before you’re pushing it beyond the minimum output level? How far can companies extend that dollar, in a sense. Lund: Traditionally, for an IT investment such as a laptop or a phone, three years. However, the change to cloud computing and using apps as a service is putting less demand on end-user devices (laptops, phones, tablets, etc.) Our strategy is to replace devices before they hit the point at which they are most likely to fail proactively, rather than waiting for a device to actually break and cause an unpredictable outage for our user. ACI: Do you find organizations are able to achieve a great level of personal flexibility and customization when providing technology to their employees? Lund: It used to be that IT’s role was to tell users, “you’re going to use this solution because this is our standard,” but now people want a personal experience as advances in consumer facing technologies have often outpaced their commercial counterparts and set different expectations. As an IT services provider, we need to balance giving our clients the greatest flexibility possible while also maintaining a reasonable cost to provision, support and securely deliver services. It’s a stimulating challenge to balance these factors in determining the best solution to provide to our business users, but it’s part of the evolution of IT as a business service rather than the “fun police” role it might have played a decade ago. This evolution is not unique to IT, expectations of workspace flexibility are also evolving and balancing a variety of user expectations. As a “nomad” without an assigned desk, I’m able to use technology to quickly find a space that fits my needs and work in an ideal space and then change locations throughout the day as my needs change. Not only am I more productive and engaged, we’re able to fit more people into less space which means the company’s real estate investments are providing a greater value.